The fastest man in the world now has a watch dedicated to him. The aptly named King Power Usain Bolt. when he broke the world records in Beijing in 2008. Usain "Lightning" Bolt, the world's fastest man, now has a Swiss watch named in honour of him and featuring his image. Hublot, for whom he is an ambassador, has developed this special model in close consultation with the champion, to mark this monumental year in sport. A truly multifaceted symbol. "It's perfectly natural to be associated with the fastest man, not just on the planet, but the fastest since the Big Bang" declared Jean-Claude Biver, Chairman of Hublot. Usain Bolt, who turns 25 this year, recently opened his season in style by completing his first individual 100 metres in just 9.82 seconds at the National Stadium in Kingston, Jamaica, as he prepares to defend three titles in London this summer: the 100, 200 and 4X100 metres. "It's a good start, I would say. It's certainly better than last season (upon his return - ed.). I feel better than last year, so I'm definitely happy with myself", said Bolt, who began his 2011 season with a time of 9.91 seconds at a meeting in Rome on the 26th May. He wanted his watch to be a fusion of the symbols representing everything he holds dear. Starting with his silhouette, THAT pose - his unique signature - stylised and immediately recognisable in an anthracite grey transfer on a black background at 9 o'clock in the centre of the movement's permanent small seconds counter. Another symbol… the choice to appear at the centre of the permanent chronograph, embodying time which constantly passes, never stopping... The chronograph movement features a central 60-second hand and a 30-minute counter at 3 o'clock (which could serve him well in his crucial preparation routine during the final countdown prior to each race). A 12-hour chronograph counter sits at 6 o'clock, and is decorated with a touch of green in a nod to the colours on the flag of Bolt's beloved home: Jamaica. Indispensable. A date window at 4.30 completes the design. The 48 mm-diameter watch, in micro-blasted ceramic, is predominantly black, with gold - Bolt's own colour and that of his lucky fetish shoes - very much in evidence, adding a further symbolic touch. The flange features a 2N gold powder coating and the strap is made from exactly the same gold-coloured synthetic leather as his shoes. 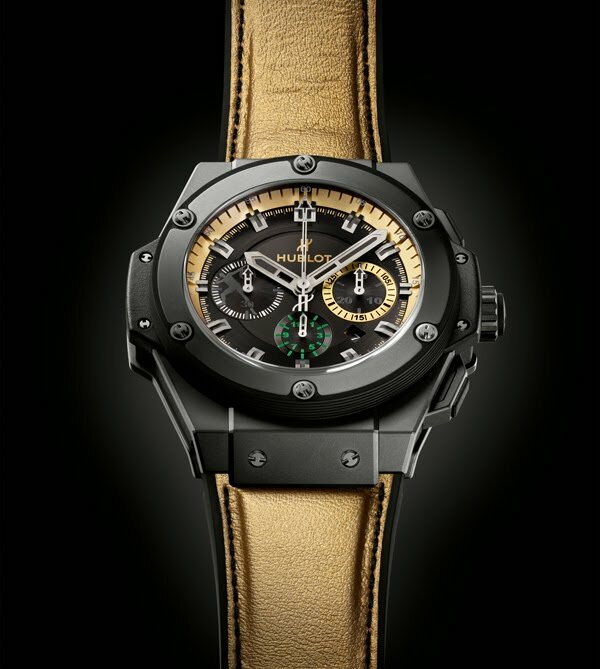 This is stitched onto black rubber - a Hublot signature - to guarantee comfort, strength and flexibility. 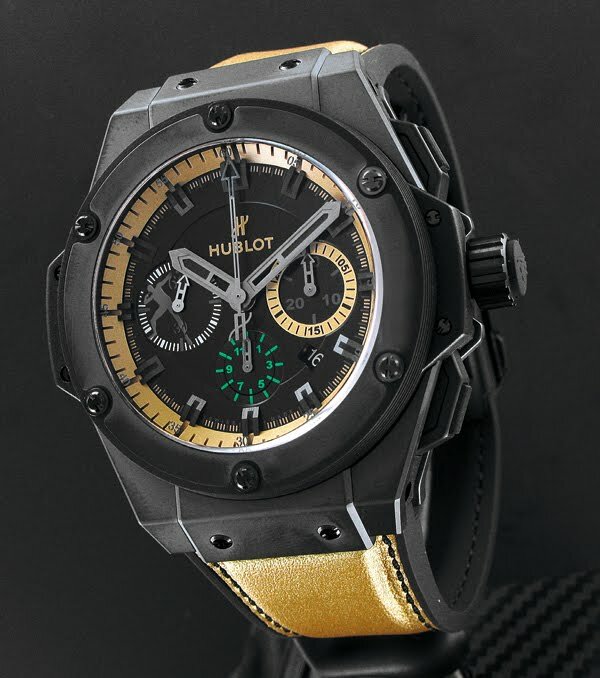 Hublot wishes Usain Bolt the best of luck! We hope his watch will become a most trusted companion during the exciting season ahead. As Bolt declared following his first successful performance of the season: "The best is yet to come!"